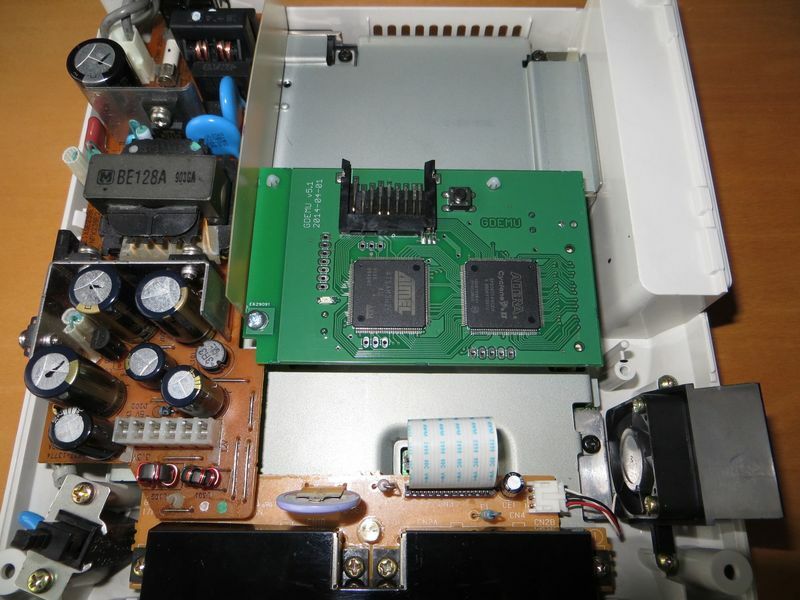 Lately another issue popped up, apparently Dreamcast power supply unit can get a bit hotter when using GDEMU instead of the original drive. I never had that issue and it wasn’t reported by anyone else so far, but I suppose it’s possible that without the drive blocking off most of the direct route from the back of the unit (where the “gills” are) to the fan in front, the PSU gets less airflow around it. I’ve been running GDEMU – it’s various versions – for many, many hours now, including no cover and open lid / not fully closed lid situations. I’ve never noticed the case to be strangely hot but I did not actually measure the temperature on the PSU itself. The report I got claimed it could heat up to just below 70°C. I don’t think it’s a problem, if you look at the design you will notice it never got any significant airflow either way and worked just fine. But for those worried I suggest you put a piece of cardboard screen fashioned to form a tunnel between the back, the PSU, and the fan. Do not remove that plastic cover though, it’s there to make sure the metal heat spreader is well insulated from mains. So, today PayPal stopped locking away the money you’ve been paying me for GDEMU. Or rather, they will stop doing it, most of my account balance is still frozen and will be like that for weeks to come. Apparently it’s because I have too many unresolved issues with my customers – and so that you know, that number is zero, not a single issue has been filed. Still, zero is a bit too much. 100% customer satisfaction is just not cutting it these days. PayPal also warned me that the lockdown might return, and listed a number of reasons for that which can basically be summed up as “because”. Well, it could be worse. I know people who had much less luck than me and got their account locked for good until they deliver blood of their firstborn, on a full moon. All of it. The good news is I got the PCBs and started assembly of the second part of the run. Now this will probably take another 2-3 weeks to finish so if you’re near the end of the waiting list you will have to wait some more. But you will get the revised PCB with screw mount. This also goes for people who ordered 2 units but received only 1 so far. ON will make the console boot the disc as soon as it detects it, which can be annoying if you have more than one on your SD card. AFAIK this only affects GD-ROM images and not CD-ROM ones. OFF will require that you manually select the controller icon to boot the game once the disc is recognized, which is probably more in line with what most people would want. The default setting for Dreamcast is ON, and keep in mind that even set to OFF it will boot the disc it finds at power-on. So to avoid that leave folder 01 empty, as it is explained in Operation section. I am still waiting for the pads to arrive. Got some but not all I need to stack them to correct height. I realize this looks very unprofessional but this particular delay is really not my fault, it’s all very Apollo 13 like at this point. 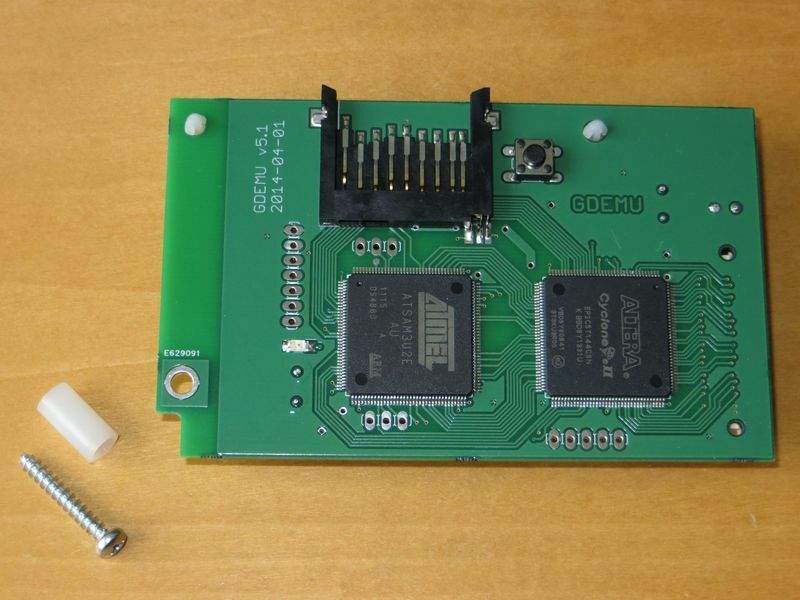 That means shipping of the latest GDEMU units will probably happen on this Saturday and not earlier. On the bright side I am making sure this particular problem will not happen again with the next batch. Apparently I didn’t make myself clear enough, so let me rephrase it: Yes, there will be a few units left for sale once I’m done sending the preordered ones. Some of those will go to people on the backup list. After that, if there are any left, I will reopen the ordering page again. I’m very happy to see there is still interest in the project but I do not take preorders via comments, sorry. I can already tell you there are more people interested than I will have leftover units – but for those that can’t get them now I’m trying to organize another production run. This time without me having to solder everything by myself. This is still being planned though, I should have some more information for you within a month or so. Please be patient. In related news, since someone asked, Bleemcast doesn’t work on GDEMU right now due to lack of proper support for MODE2 images, and a few minor issues in the code as well. I have already developed a new version of firmware that does run Bleemcast beta, though the cracked per-game versions still hang at the legal notice. This has to so with the disc image being a bit tricky, I’m not sure if it’s worth fixing the problem if it slows down GDEMU too much. I’m still looking into it. On a related note, I’m setting a new rule: If I mail you, or request payment, and you don’t answer for a week? I will cancel your preorder and send the unit to someone else. I understand that some of you are very busy, or have simply forgotten to reply/act, but I can’t keep unsold GDEMUs too long. No hard feelings. Hopefully you’ll be able to get one sometime later, if you still want it. The last units of the first 50% will be sent this week. There was a small delay with those due to all local shops running out of the felt pads I use. It seems I bought all of the stock and the other ones are not very suitable for my needs. So I had to order online and there was another delay. This all should be resolved this week and the GDEMUs will be on their way. Envelopes are already waiting. In other news, PayPal released enough of my money to continue GDEMU production so I will resume work soon.